It’s an awful turn of events. : A few weeks ago, Gateway Pundit posted a story about a teenager who decided to open a hot dog stand to help out his two disabled parents in Michigan. : It was shut down by the city since it violated a city ordinance that prohibited competition within the local restaurant district. : It was documented by the Mackinac Center for Public Policy. : The original video is below. 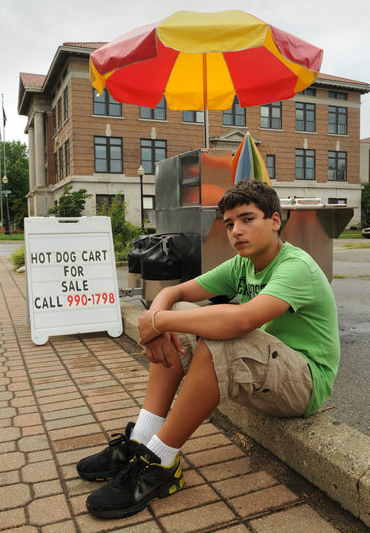 Several weeks after a city zoning officer: shut down: his hot dog business, 13-year-old Nathan Duszynski and his parents are homeless. The family was hoping Nathan’s hot dog cart could help them through a difficult time. : Nathan’s mother, Lynette Johnson, suffers from epilepsy and his stepfather, Doug Johnson, has multiple sclerosis. Their illnesses have restricted them from finding permanent, full-time work. The family receives about $1,300 a month in disability payments, Medicaid and food assistance. The three are having a hard time staying together. : MLive: confirms what the Mackinac Center learned Thursday – Nathan and his mother are staying at the Holland Rescue Mission. Nathan wanted to help out his family by selling hot dogs from a cart he: bought with money he saved. : He worked out an arrangement with the owner of a local sporting goods store to sell hot dogs in the parking lot. The owner of the store thought it would be a great way to attract customers and even offered Nathan a sales commission if he got people to rent his motorized bicycles. The city of Holland, however, shut down the business 10 minutes after it opened, informing Nathan it was in the city’s commercial district where food carts not connected to downtown brick-and-motor restaurants are prohibited. The Mackinac Center’s coverage of the issue has drawn: national attention. A video of the mayor’s comments and the latest on the family’s plight will be posted soon.